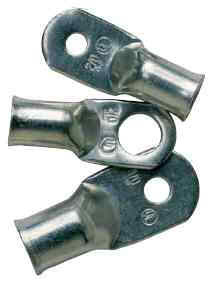 ANCOR Marine Grade™ lugs are manufactured from heavy duty annealed tinned copper, providing for maximum current flow. • 100% tin plated copper resists corrosion from salt and moisture. • Seamless barrel design allows for maximum strength when crimped. • Closed end design seals out moisture so cables stay dry and corrosion free. stranding increases resistance and temperature which in turn leads to a faster rate of corrosion.